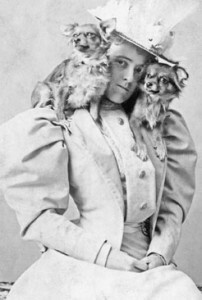 Wharton had a passion for small “toy” dogs as many of her photographs prove. Although I’m partial to my darling Shih-Tzus, Wharton loved other toy breeds. She owned several Pekingese (as was her favorite dog, “Linky”), as well as Chihuahuas and Papillons. They were her friendly and loyal companions, which irritated some of her acquaintances. Luckily, her best friend, Henry James (the author, not a dog), shared the same affection as he doted on his beloved Dachshunds. Interestingly, Wharton died in 1926, only several months after Linky died. Depression and loss of a good friend can take a toll on a lonely soul. Kerfol, one of Wharton’s short stories from Edith Wharton’s Ghost Stories, includes a full cast of little canine characters. Unfortunately, these sweet and furry creatures fall into the hands of a jealous and violent husband. The story takes place on the estate of Kerfol (past and present). A sense of loneliness covers the tale like the dust that has settled upon the desolate estate itself. Presently, it is up for let, but several furry inhabitants show up to meet the potential buyer, prompting an old book containing the history of Kerfol to be opened. That’s when the real story begins. Knowing how much Wharton loved dogs, she must have viewed her character, Yves de Cornault, lord of the domain of Kerfol, as detestable. Most of us would agree that there is something contemptible and sinister when an innocent creature is harmed. And sometimes even good people do bad things when jealousy or greed rules their spirit, as we see it was in de Cornault’s case. If Edith were alive today, I have no doubt she would play an active role in the Humane Society. Maybe she would write their copy? Or maybe not. But this I know: She would stand up bravely for all of our four-legged friends.